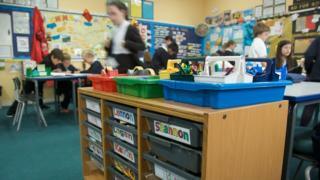 One of Scotland's largest councils has said it will scrap the controversial P1 assessments. Fife Council said it would discontinue the scheme after the end of this school year, and it plans to bring back the previous system of assessment. Education Secretary John Swinney said the move by the council made "little sense". The current assessments - labelled tests by critics - have been condemned by unions and opposition politicians. BBC Scotland's education correspondent Jamie McIvor said it is not completely clear whether a council actually has the power to scrap the assessments. Some others, including Aberdeen, have previously said they are looking at the possibility of doing this. How do tests for P1 pupils work? What are P1 assessments really like? Fife will continue to use standardised assessments in P4, P7 and secondary schools. The national scheme was designed to replace the variety of different assessment schemes used by different councils. One aim was to get data to help show which schemes were successful in raising attainment. John Swinney, who is deputy first minister as well as education secretary, criticised the council's announcement. He said: "If Fife Council were to revert to their previous systems, P1 pupils would face two assessments per year, rather than the single assessment they currently undertake. The EIS also questioned the plan to return to the previous form of assessment. A spokesman said: "While we welcome the council's decision to scrap SNSAs for P1, this should not be at the cost of a return to Fife's previous system of over-using standardised assessments - every year with all age groups. "If the council is serious about ensuring that all assessment genuinely supports learning and is committed to relieving the pressure that standardised assessment places on pupils, they should not be replacing SNSAs with a model that is potentially more damaging." Although unions have criticised the assessments, some teachers have spoken of how useful they are as one of a range of tools to gauge pupil's progression. Following criticism, MSPs voted to "halt" to the tests. The Scottish government has commissioned an independent review of P1 assessments to reconsider the evidence. It is expected to report next year.